As I write, I’m feeling the dog days of August, a phrase that comes from the sultry weather associated with Sirius, the Dog Star, which usually rises with the sun during the hottest days of summer. Happily, respite can be found on a few select evenings this month here at La Grua Center. 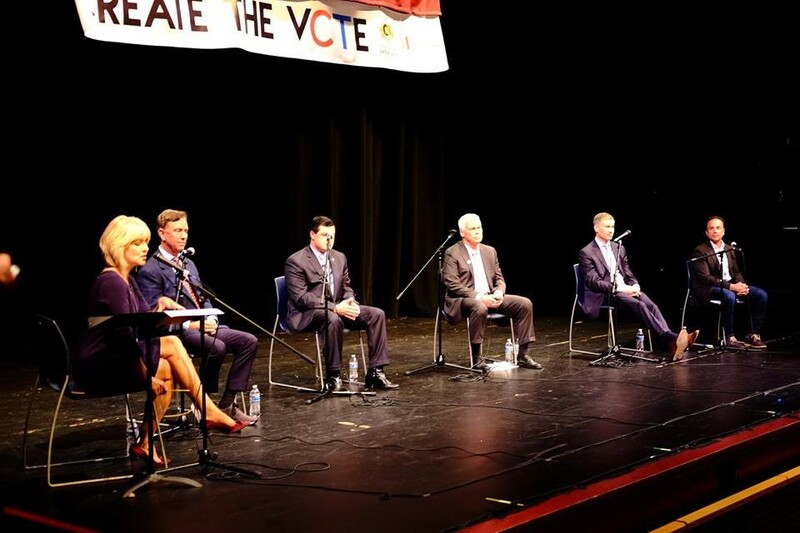 Create the Vote: The above image shows WTNH-TV’s Ann Nyberg moderating a forum with five gubernatorial candidates discussing the arts, culture, and the economy sponsored by the CT Arts Alliance (La Grua was among the nearly 100 co-sponsors). I was in New Haven Tuesday night, and it was a big step forward for Connecticut’s arts and culture community. While the state’s budgetary issues are profound, those of us in Southeastern Connecticut understand how important the arts and culture are to tourism and to the economy here, especially when considering the Mystic Seaport Museum, the Mystic Aquarium, the Submarine Force Museum and Library, the two casinos, and the new National Coast Guard Museum. The fact that five serious candidates for governor (from left, Ned Lamont, Tim Herbst, Oz Griebel, David Stemerman, and Joe Ganim) had to learn about our sector and address some of our concerns in public is a big deal. If you’re a Republican or Democrat, please make sure you vote in the primary on August 14. And if you’d like to see how the candidates feel about arts and culture, go here to check out their statements (or lack thereof). Welcome Home: And then next Friday, August 10, at 7 p.m., we are the site of Bergin O’Malley’s return to her home in Stonington with the release of her latest album, entitled Somebody. Kelli and I often had the treat of hearing Bergin come by and play La Grua’s 1922 Mason & Hamlin grand piano, and it’s a real perk of the job. We’re very eager to hear what she’s up to and happy to be in a position to support her new work, along with Glenn’s. How We Look At Art: Art historian, curator, and critic Alison Green joins us on Thursday, August 16, at 6 p.m., to talk about her new book When Artists Curate, which we’ll have available for sale and signing. She will provide us with the first critical history of visual artists curating exhibitions, including such artists as Andy Warhol, Thomas Hirschhorn, Daniel Buren, and Rosemarie Trockel. Artists actually curate all the time, starting in their own studios. But what changes when an artist curates an exhibition as opposed to a professionally trained curator? La Grua is the place to find out. A Late 19th Century Chamber Afternoon: We welcome back pianist Artem Belogurov, this time with cellist Octavie Dostaaler-Lalonde, as they explore several Bach pieces on Saturday, August 25, at 5 p.m. for our August Music Matters concert. Artem is very excited to be playing the 1886 Chickering piano residing with us for a couple of months. This concert will honor the memory of Stonington poet J.D. “Sandy” McClatchy, who passed away in April of this year. Morning at Watch Hill Marina: The award-winning oil painter Susan Stephenson has given La Grua Center one of her paintings to sell to benefit our programming. Known for her color-rich, sun-drenched landscapes painted from direct observation, this 1999 painting documents the marina in its earlier days. Susan taught at Lyme Academy College of Fine Arts for 20 years, and now teaches painting at California State University, Stanislaus. This is a rare opportunity to find a Stephenson original for sale, and she has donated it in honor of the late Juan O'Callahan who established the youth art workshops at La Grua Center. The painting is displayed on our piano so you can come in and check it out. Hope to see you around—stay cool!